Happy Mothers Day to all the moms out there! Mother’s Day always brings back special memories for me, and my late mother Jackie. My mother devoted her life to her kids, husband, and her church. Prayer was a big part of her life, and she had a great love for sewing and quilting. She could make a complete wedding dress, or just a simple ocassion dress. I always envied her skill. She always told me to have patience, and god will find a way to make my life complete. Funny how in today’s time, people forget that so easy. Jackie especially loved the famous wedding ring quilt, I believe she started one – but her life was cut short several years ago and never finished it. So I finished it for her, and I added a special prayer too. 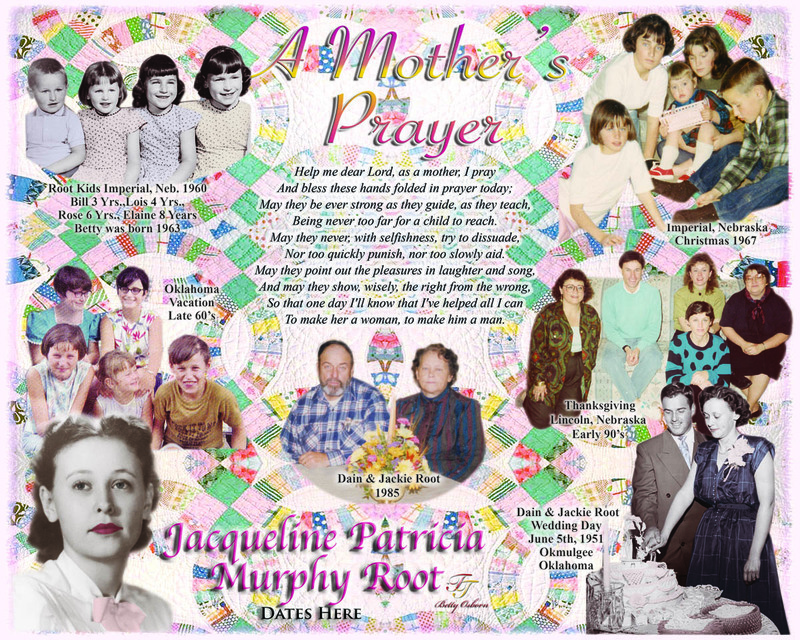 A Mother’s prayer is part of the All in the Family series. The background is quite colorful, and would work great for grandmother’s too. The power of prayer, I believe that it works. So here’s one for you mom.